Mass exodus at Muir? What the heck is going on? There appears to be serious problems at Muir. Two of the Mustangs’ top returners — Wide receiver Jamire Calvin and defensive back Elijah Blades — have left the program and transferred to Cathedral. Calvin, a junior, caught 27 passes for 279 yards and a touchdown last year. But with his blazing speed and ability to make people miss in open space, would have been counted heavily in the offense this year. Especially with leading receiver Taeon Mason graduated. Blades, also a junior, will play defensive back at Cathedral and some receiver. Both players are expected to develop into next-level prospects. Prior to the above departures, running back Jaylyn Newson, left after the first semester. His whereabouts are unknown. This isn’t the way first-year head coach Antyone Sims wanted to start off. Sims took over for John Hardy, who was let go by the school shortly after last season despite a successful three-year run. Muir lost twice to Cathedral last season, once in nonleague play and once in the playoffs. The two teams play again on Sept. 4 at Cathedral. Aram’s Take: I’m sour. Was looking forward to covering these two. Had heard all about them coming up and now they’re at Cathedral. 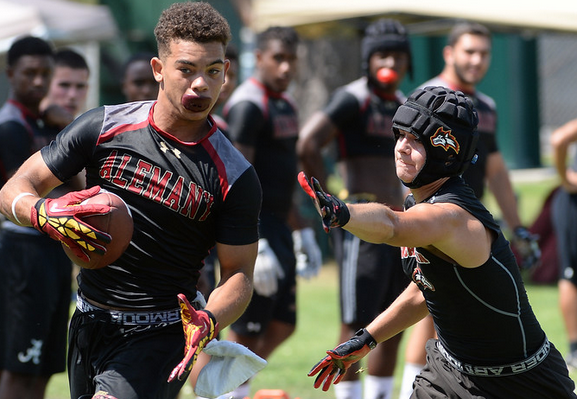 Alemany beat Norco to win Saturday’s Bonita Air Assault. The final four were the two mentioned above along with Villa Park and Etiwanda. Charter Oak was the No. 1 seed entering Saturday’s knockout round but got upset by Villa Park. Bonita won the conso bracket. Aram’s Take: Pretty wack. No locals in the final four. CO was the SGV’s big hope but it got stunned by Villa Park, which can be very pesky at these tournaments. Whatever. More mythical hardware for the Bishop Amat High School football team. The Lancers, nationally ranked at No. 24 last week by MaxPreps, has been installed as the No. 1 team in the state, according to the CalPreps.com ratings for the upcoming 2015 season. Bishop Amat carries a lofty 80.2 rating. No. 2 is St. John Bosco … perennial power De La Salle is No. 4. @aramtolegian and that's no dis to Amat. They will be top 10. But No 1 sounds like nobody saw that state final. … but there’s no denying Amat is going to be a force to be reckoned with and will have every chance to live up to this rating. Now, where the hell is Mater Dei? Mission Viejo? Not in the Top 10? But Rancho is? First games on Friday are at 3 p.m. The latest Pac-5 team in the ultra-important MaxPreps national Top 25 rankings is Corona Centennial, which is No. 6. That means there’s two teams (so far) in the Pac-5 that MaxPreps thinks is better than Ole Amat. I know, I know, Amat fans are about to drop all the cliches about rankings not meaning anything. Spare me. It’s a good conversation piece. Personally, I think Amat is better than both teams (from what I can tell). But hey, that’s just me.